Marjory Stoneman Douglas High School senior Jaclyn Corin, right, and other students who founded March For Our Lives after the Feb. 14 shooting, talk to reporters following a press conference near the state Capitol in Tallahassee. 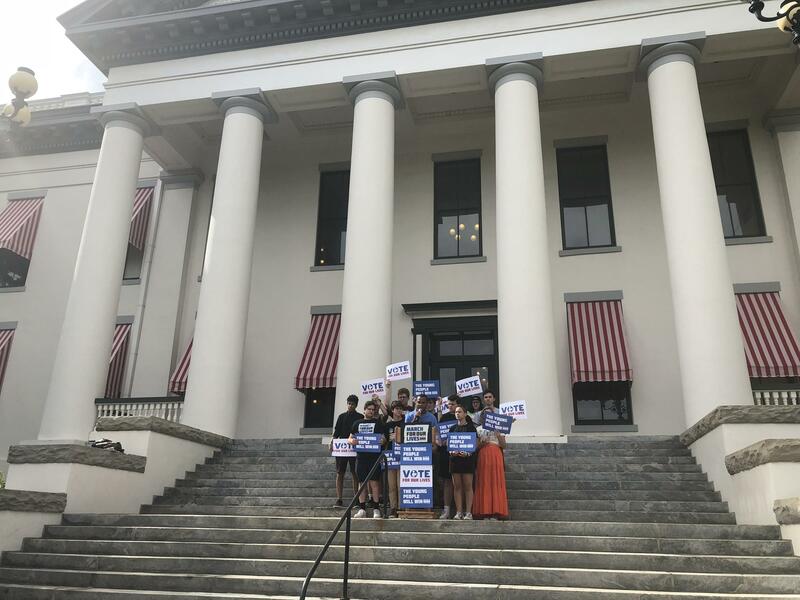 González and some of the other best-known Parkland-survivors-turned-activists — including David Hogg, Jaclyn Corin and Delaney Tarr — held a press conference in Tallahassee one day before the midterm elections. It was the latest stop in their national tour urging people to vote for candidates who support gun control. 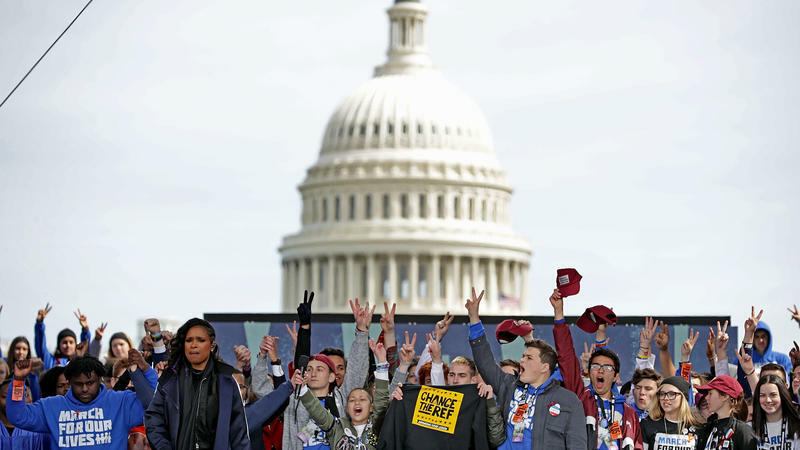 Wearing a black t-shirt that said "the young people will win," González listed the names of all 17 people who died at Marjory Stoneman Douglas High School on Feb. 14. She said they were heroes — but that they didn't have to be. She argued their deaths could have been prevented if legislators had passed gun control laws after the earlier shootings at the Pulse nightclub or the Fort Lauderdale airport or to address everyday neighborhood gun violence. The students who founded March For Our Lives hold a press conference on the steps of Florida's old state Capitol building in downtown Tallahassee. She said voting is the best way to prevent more violence in the future. González is now a college freshman. She said she voted for the first time from her kitchen table. "It was pretty cool," she said. "I listened to Kendrick Lamar while I was doing my absentee ballot." Corin, a senior at Douglas, voted early last week at the recreation center in Parkland. It was her 18th birthday. "It was amazing," she said. "I voted with my dad. It was just an exuberant feeling." Corin wouldn't say who she voted for specifically but stressed she supports candidates who will fight for universal background checks and "red flag" laws that allow guns to be taken away from people deemed to be dangerous. González offered a clue about who she didn't vote for. A reporter asked González if she thought the Parkland students had something to do with Republican Gov. Rick Scott earning a C rating from the National Rifle Association this year, down from his previous A+. "I don't know, because I don't like to think very much about Rick Scott," González quipped. 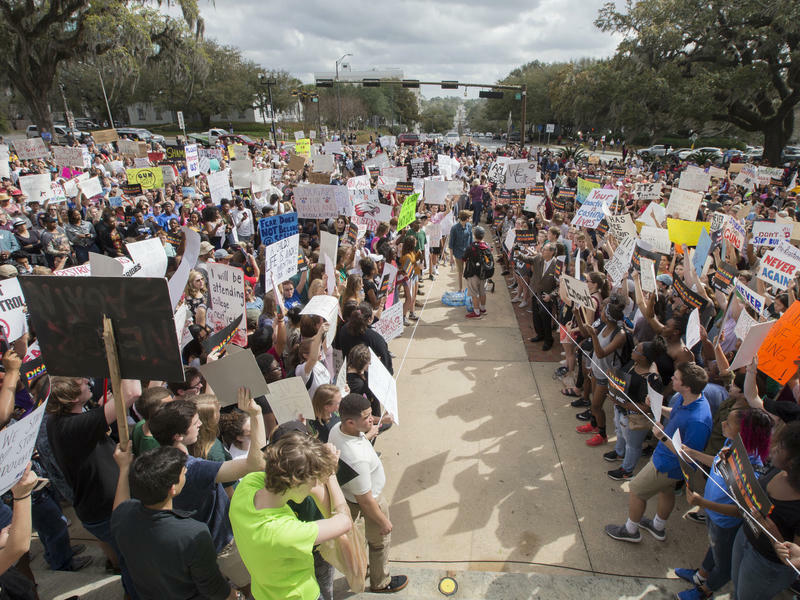 Scott signed a bill after the Feb. 14 shooting that, among other things, raised the age for buying a gun from 18 to 21 and instituted a three-day waiting period before purchases. The NRA is suing over it. Scott is now in a tight race for a U.S. Senate seat against Democratic incumbent Bill Nelson.